This is a (very limited) wiki on proofs. I've always been interested in proofs, since they seem both precise and vague, obvious and enigmatic at the same time. I started out rewriting proofs I've read, including proofs of why the square root of 2 is irrational and why the number of primes is infinite. Another proof looks at the Fundamental Theorem of Arithmetic. Standard condensed proofs are difficult to read, so I've expanded upon them using a kind of statement–challenge approach. Someone claims X and the demand rings out: “Why?” The chain of Whys continues for a while (but not forever!). For my exposition of the Fundamental Theorem of Algebra I used a conclusion-first kind of explanation as I worked through some equations, but the general explanation used a more start-to-finish point-form structure on two levels: a quick overview and a somewhat more detailed one. Latest proof is a rewrite of a proof I read about linearly independent automorphisms in Galois theory, and that old chestnut, the Pythagorean theorem (new rewrite uses a chain of Becauses). I also tried out a proof calculator Jape a while ago. Remember… I'm not an expert. I have no math degree. Take all this with a grain (or bucket) of salt. If this (sometimes sloppy) reordering of proof steps is helpful while you have a standard proof beside you, then I'm happy. An unusual and attractive edition of Euclid was published in 1847 in England, edited by an otherwise unknown mathematician named Oliver Byrne. It covers the first 6 books of Euclid, which range through most of elementary plane geometry and the theory of proportions. 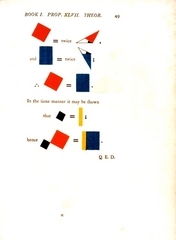 What distinguishes Byrne's edition is that he attempts to present Euclid's proofs in terms of pictures, using as little text - and in particular as few labels - as possible. What makes the book especially striking is his use of colour. 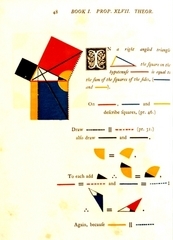 The theorem proved on the two pages is I.47, the Pythagorean Theorem.